NeST Group is pleased to announce the start of the demo project to clean up the Perandur Canal flowing through the heart of Ernakulam. Perandur Canal due to its highly polluted state with human waste, chemical waste and any other imaginable kind of waste, polluting its water, has become a curse for the City. Lot of efforts has been done to keep the Canal clean in the past, however all such efforts have failed in the past since there is no collective determination from all the stakeholders to overcome the challenge. Today it has become a serious health hazard for the public not only due to water pollution but also due to air pollution that it is causing to the vicinity where it is flowing. NeST Group, the technology torchbearer of Kerala have been working with Japanese Technology Partners to bring up an apt and sustainable solution to the vexed problem of cleaning up of the polluted water bodies. 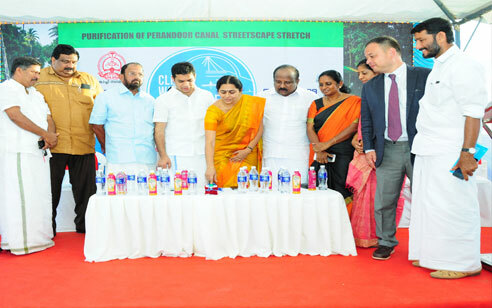 NeST as part of its social commitment has taken the lead to introduce latest world-class technology to undertake the first water body cleaning up project from their own homeland, Ernakulam by taking up the cleaning up of the Perandur Canal flowing through the Street Scape stretch of Panampilly Nagar with the support of Kochi Corporation. The trend setting water purification system utilizes microbubble technology to restore impure water in water bodies. This exercise will prove how the new technology can provide a lasting solution and provide humanity with much awaited breakthrough in this field so that respective agencies can take up cleaning of remaining stretch of Peranadur canal and other water bodies. Smt. Soumini Jain, Worshipful Mayor of Kochi Corporation inaugurated the cleaning of demo stretch of approximately 1KM of Street Scape of Panampilly Nagar on 3 rd December 2017 in a meeting presided over by V.J Vinod, Deputy Mayor of Kochi Corporation. Hibi Eden MLA was the Chief Guest on the occasion. Shri N. Jehangir, Vice Chairman and MD of NeST Group commented that NeST is happy to bring a proven and patented Japanese technology to Kochi for cleaning up of the water resources of our land. This technology is already in use in Japan, China and many counties across the world. He said, 'once our Canals and Lakes are cleaned up, we can regain our lost glory when these water bodies were used for transportation and as livelihood of many fishermen folks. It will also provide a cleaner environment to our next generation'. Jehangir also requested the support of everyone concerned about their own health and about the health of our future generations to join hands with this project to make it a grand success. NeST, together with their Japanese technology partners have been conducting various studies during the past one year at their own cost to identify most appropriate and environment friendly technology suitable for our conditions. Technology experts from Japan have come and spent considerable amount of time in Kerala with appropriate equipment to conduct preliminary trials. After the success of the preliminary trials, NeST has undertaken this task of cleaning up of Street Scape stretch of Panampilly Nagar. NeST will continue this exercise for next one month to demonstrate the effectiveness of this trend setting technology. NeST is confident that this humble initiative will go a long way to keep our water bodies clean.